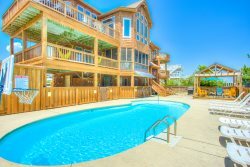 Beautifully decorated and cozy, The Peal is an enticing oceanfront home in Kitty Hawk with breathtaking views of the ocean, a direct walkway to the beach, and a sundeck with Adirondack furniture for taking in the scene. Take one step off the deck and you'll be able to feel the sand between your toes, at this sunny oceanfront retreat. Located in the heart of Kitty Hawk, you'll find many restaurants, attractions, and shopping just a walk away - One of the best values on the oceanfront! With one level living, it’s easy to connect with the family, or find your own private haven in this three bedroom home. Gather in the living area for family movie nights or to recap the beach adventures of the day, or whip up seafood feasts in the nearby kitchen with breakfast bar. When the stars come out, you’ll want to step outside to enjoy the view from your private ocean-facing deck. With the waves of the Atlantic serving as a constant background, vacation memories have never been sweeter at the illustrious Pearl. Property Layout: All on one level!